Post-show buzz is always an immediate barometer for a great collection before the reviews are officially out. 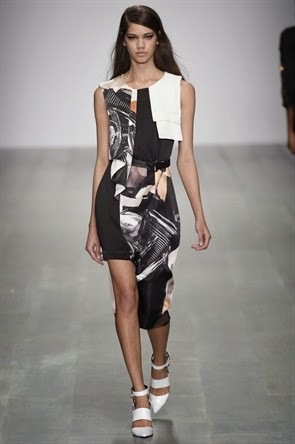 Glowing reviews in 140-characters or less were all over Twitter within minutes of the finale, indicating Jean-Pierre Braganza‘s SS15 collection was a hit. Jean-Pierre’s signature fluid tailoring and geometric prints were prevalent but much more muted than previous seasons, marking a much more commercial collection. The 80s were a clear influence, with strong, sometimes embellished shoulders against a mainly monochrome colour palette. Highlights included asymmetric dresses with graphic print panels, mesh panelling and the power waistcoat with bold cut outs.